Synopsis: This drill gets a lot of players active on one court working on serving, passing, setting and hitting – and potentially blocking and defense. Age/Skill Level: This is a drill for intermediate and higher levels. Requirements: 14+ players, 4 balls, a net. Execution: Set the players up as shown in the diagram below – two passer/hitters on each side, two servers behind the end lines, and one setter on each half court. The half courts run independently as separate drills. The drill begins with a serve going to the pair of Passer/Hitters with the setter on their side. One of them passes the ball. 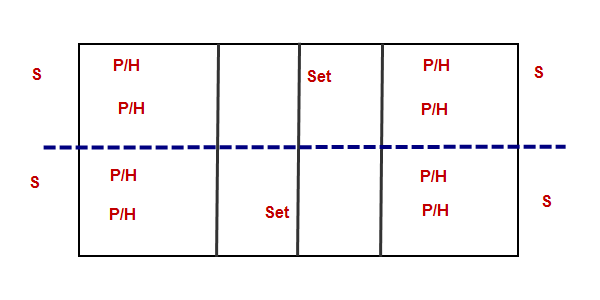 The setter sets to either P/H. That player than goes to become the server on their side. The setter switches sides and the drill repeats for the other side. The server then goes in to replace the P/H who hit the ball the repetition before. If you have sufficient numbers, you can have 4 setters in the drill and not have them flip sides. If you have extra non-setters you can have the extras in the service area where they can be ready to serve straight away following a miss. You can let the players to play out a rally rather than just having the attacked ball to be the conclusion of the repetition. If you don’t want to use fixed setters, you can have the hitter rotate to setter, and the setter rotate to server. You can make this something of a butterfly by having the hitter collect their ball and go to the other side to serve rather than stay on their own side. This may require having more than just 14 players, however, depending on the skill of your players and the size of your gym (ball chase time). Having the players play out the rally would be more easily done if you have two setters on each half court rather than just one, but it can still be done with one setter quickly ducking under the net each time the ball goes over. Of course this drill can be done with fewer numbers using a full court. The idea in this case, though, was the show a way to incorporate a large number with as many active players as possible.